Our objective: To make low-carbon heating and cooling affordable for everyone. Horizon 2020, the multi-annual programme for research and innovation of the European Union (EU), is launching two new funding opportunities for thermal storage projects to support the implementation of IC7. Deadlines are in February 2019. An IC7 meeting on gas heat pumps took place in July 2018 in Pisa, Italy. A technical workshop on an IC7 priority, Predictive Maintenance and Control Optimization of Buildings, was held September 2018 in Montreal, Canada. The concept of the Climate Comfort box, equivalent to the Turing Machine for computing, was introduced at the third Mission Innovation Ministerial’s Solutions Summit by IC7 in collaboration with the IEA’s Technology Collaboration Programmes. In November 2017, IC7 held an Expert Workshop in Abu Dhabi, United Arab Emirates. The summary of this workshop defines the work-streams and priority areas under IC7 and has spurred the results described in this page. Globally, buildings account for almost a third of final energy consumption, with space heating and cooling, and the provision of hot water, accounting for approximately half of this consumption. The ultimate goal of the affordable heating and cooling of buildings Innovation Challenge is to develop core building heating and cooling systems and measures to improve building envelopes that deliver affordable heating and cooling without the carbon emissions. The relative energy demand for heating and cooling varies globally. In the Northern Hemisphere energy consumption for space and water heating is steadily increasing. Cooling currently represents a smaller proportion of global energy demand, though it is an area of significant future growth, with an 300% increase in space cooling demand anticipated by 2050 in emerging and developing economies. Increasing global temperatures resulting from the effects of climate change will also contribute significantly to this growth. Currently, three-quarters of the global energy requirement for heat is met by burning fossil fuels, and one third of global energy-related CO2 emissions can be attributed to the provision of heat. Energy consumption for space cooling is primarily dependent on electricity and to a lesser extent natural gas, so is also associated with a high carbon load. In order to encourage low-carbon heating and cooling uptake, solutions should cost the same or less than fossil fuelled alternatives. A particular challenge relating to low-carbon heating and cooling is the mismatch between supply and demand. Significant daily and seasonal variations in heating and cooling demand are compounded by daily and seasonal variations in the supply of energy from renewable sources. This results in a need for intra-day and, in some regions, inter-seasonal energy storage. Affordability needs to be judged at a systems level, with energy efficiency also an essential element within this Innovation Challenge. Innovation through the use of new materials, processes, and systems provides a significant opportunity to reduce energy consumption and CO2 emissions. Such innovative technologies and practices have important economic and social potential with respect to reducing energy bills, enhancing global access to energy, increasing the competitiveness of renewable technologies and improving energy security. This Innovation Challenge will provide a platform for international collaboration with the potential to considerably accelerate innovation in the heating and cooling arena. It will involve the development of new solutions and taking cost out of existing and emerging solutions. This will be achieved through the collective research effort and the commitment to double spend on clean energy research. 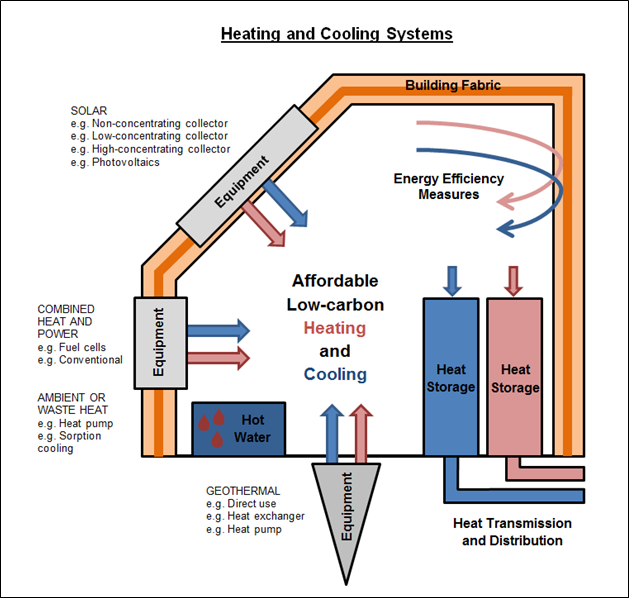 Figure: Heating and Cooling Systems for Buildings. This Innovation Challenge has six main areas of focus. In each case, the need is to develop lower cost, practical alternatives to today’s fossil fuel based solutions. Thermal Energy Storage solutions to match energy supply to heating and cooling demand, enable buildings to support wider smart energy networks or to adapt the internal climate within buildings to take advantage of passive heating and cooling opportunities. Heat Pumps research to accelerate the uptake of both electrically and thermally driven heat pumps by improving performance, reducing cost and achieving a more effective integration and also to explore opportunities to exploit the availability of secondary heat. Non-Atmospheric Heat Sinks and Sources activities to explore the most promising technologies of evaporative cooling, ground/sea/aquifer/wastewater sources/sinks and low-wavelength radiation to deep space and improve performance of conventional air-cooled air conditioning systems in hot climate. Predictive Maintenance and Optimization using emerging ICT technology and big data science to automate poorly maintained, degraded, and improperly controlled equipment for heating, cooling and air conditioning, responsible for wasting up to 30% of building energy used. Physiological Studies for Thermal Comfort involves the appropriate understanding about human comfort needs, depending upon physiological, psychological and behavioral conditions. Different climates and contexts need various approaches for cooling and heating. Methods to optimize heating and cooling comfort technologies for design, installation and operation are a core focus. Non-technological issues, such as user acceptance, bridging the gap between R&D and industry, skills and training. All six focus areas require a systems approach to investigation to ensure that integrated solutions provide a complete solution tailored to the needs of different regions and cultures. For new and existing renewable heating and cooling technologies, innovation is required to improve competitiveness, efficiency, reliability and the potential for integration within energy management systems. This requires cross-border and cross-sector collaboration between Mission Innovation governments, private investors and research leaders. Collaboration is the foundation of this challenge, facilitating rapid identification of the baseline and innovation opportunities, and accelerating research and development. Ultimately, international collaboration will bring the best methods of affordable, low-carbon heating and cooling solutions to the global market as quickly as possible.